commercial phase | What's Left? This is the conclusion to my overlong analysis last column of the crisis of the Left and the crisis on the Right (Party like it’s the 1960s: “What’s Left?” July 2017, MRR #410). Interregnums are instances of revolutionary class conflict, either regional and diffuse (Great Peasants’ War, 1524-25; English Glorious Revolution, 1688) or more consolidated and national (French 1789 Revolution, Russian 1917 Revolution, Spanish 1936-39 civil war). Related regional interregnums were strung together into a broad, territorial interregnum (religious conflicts/wars across continental Europe, 1517-1648), while associated national interregnums were linked into a global interregnum (WWI through WWII, 1914-1945). The French 1789 Revolution gave rise to our modern Left-Right political landscape and modernity itself. 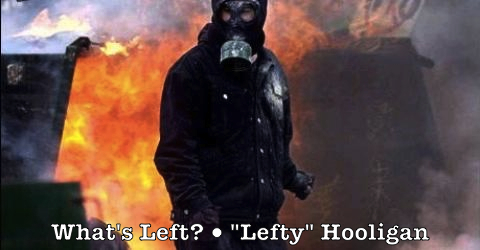 The Right is both a revolt against the modern world and a reaction to the Left. In Europe, the moderate Right and reactionary Right were joined by a Fascist Right, while in the United States various radical and new Rights emerged. But in the face of international socialism and communism after WW2, an effort was made by Buckley and the National Review to define, unify, and defend an official conservative movement. When the Left in the 1980s experienced a crisis due to the defeat of organized labor, the collapse of real existing socialist regimes, and the decline of Marxism, the Right underwent a corresponding crisis. More fractious than the Left due to its non-programmatic, non-rational nature, the Right exploded, particularly in patriot and populist terms. The secular, religious, and xenophobic Right can barely contain the proliferation of groups and ideologies, unlike the Left which neatly divides into antiauthoritarian, parliamentary, and Leninist types. Because the Right is invariably a reaction to the Left, when things fell apart and the center on the Left could not hold, mere anarchy was loosed both on the Right and the Left. The crisis of the Left was matched by a crisis on the Right—with mindless proliferation, sectarian infighting, and growing Red/Brown crossover on the Right—which in turn marked the beginning of another global interregnum. But what is the cause of this crisis on Left and Right, and of the global interregnum? Is it the fabled Marxist final crisis of capitalism? First, I need to backtrack. I called myself paleo, more or less orthodox, and old school in my Marxism when it comes to class struggle, modes of production, and the origins of modernity. Yet I’m also hep, au currant, and with it when it comes to updating my Marxist political economy with a little world systems theory (Braudel, Wallerstein, Arrighi). Capitalism started to develop in embryonic form as a world system of exploitation and appropriation as early as 1450, and went through two cycles of capital accumulation (the Genoese and Dutch cycles) prior to the British cycle which acted as a context for the French 1789 Revolution and Europe’s industrial takeoff. So not only is it correct to call the English civil war (1642-51) a prequel to the bourgeois revolutions that ushered in the modern world, it’s clear that the Renaissance prefigured the Enlightenment, and that the modernity of Machiavelli and Hobbes presaged the modernity of Locke and Rousseau. The extensive trading networks, market relations, and commercial expansion of capitalism prior to 1750 did not possess capital’s “relentless and systematic development of the productive forces” that the industrialization of the British cycle initiated, as Robert Brenner and Ellen Meiksins Woods noted. Whether we call the period from 1450 to 1750 pre-capitalism or proto-capitalism or market capitalism, we need to distinguish it from modern capitalism proper after 1750. Hence the use of the French 1789 Revolution as a convenient benchmark for the advent of modern industrial capitalism, modernity, and modern Left-Right politics. The Marxist-influenced world systems school argues that each cycle of capital accumulation responsible for the rise of the current world economy is comprised of commercial, production, and financial phases. The commercial phase is characterized by making profit from trade and commerce—simple circulation and exchange. The production phase is distinguished by making profit from the whole process of industrialization—building factories to produce commodities, hiring workers, paying them less than what the commodities are sold for, and then valorizing the resultant surplus value into capital. The final financial phase is typified by making profit from investing in everything else that makes money—trade, commerce, manufacturing, factory production, services—which is just one step removed from simple exchange and circulation once again. What is most profitable in this three-phase cycle schema is the production phase because that’s where infrastructure is produced, the working class is reproduced, and capital is fully valorized. The commercial and financial phases are merely making money off of circulating money, and the financial phase in particular is seen as capitalism in decline. This tripartite model is problematic and weakest when it comes to the pre-industrial Genoese and Dutch cycles, and only comes into its own with the British and American cycles. What’s more, its best to take this theory as descriptive rather than prescriptive. The center for world capitalist market power shifted from Genoa, through the Netherlands and Britain, to the United States, where it is predicted to shift again, probably to Asia, since American-centered capitalism is financializing and thus in decline. But will that shift occur? Or are we in the End Time, the final crisis of capitalism? This model works admirably well in describing what happened when American-based capitalism changed from production to finance, which can be pinned down roughly to 1973. The Keynesianism of the Kennedy/Johnson era transitioned to the neoliberalism of the Thatcher/Reagan era when the political and cultural unrest, growth in social programs and expansion of the welfare state, and strong organized labor and strong middle class of the 1960s gave way to the rollback of government regulations, the welfare state, the public realm, and unions of the 1980s. The neoliberal trend began when the rank-and-file labor rebellions and wildcat strikes of the 1970s were routed, then was formalized with the defeat of organized labor by Reagan’s breaking the PATCO unions and Thatcher’s trouncing the striking miners, and was finally enshrined with the collapse of the Soviet bloc. Marxism appears to be bankrupt. This is, of course, the beginning of my crisis of the Left and on the Right, and my global interregnum. But why did it happen? The short, Marxist answer is that the change from Keynesianism to neoliberalism, from affluence to austerity, from production to finance, is due to a tendency for the rate of profit to fall. If I had to choose between the lively polemics and exhortations of the 1848 Manuscripts, Communist Manifesto, and Critique of the Gotha Program versus the dry scientific analysis of Capital’s three volumes, I would choose the former every time. That’s because my mathematical chops are seriously lacking, even though I think there are insights to be had in Marxist economic statistics, formulas, and models. One such outstanding Marxist economist was Henryk Grossman whose work The Law of Accumulation and Breakdown of the Capitalist System attempted to formulate mathematical laws of capital accumulation, how it operates and why it falls short. The tendency for the rate of profit to fall (mainly due to the changing organic composition of capital) can be offset by capitalism’s creative destruction (state austerity, economic depression, war). In the grand scheme of things then, when capitalist production became less and less profitable the economy transitioned to finance capitalism. Neoliberalism as the ideology of finance capitalism is all about deregulating and financializing the economy, rolling back the welfare state, crushing organized labor, and privatizing the public realm to reverse the falling rate of profit, and as such it’s a rightwing ideology of capitalist decline and crisis. 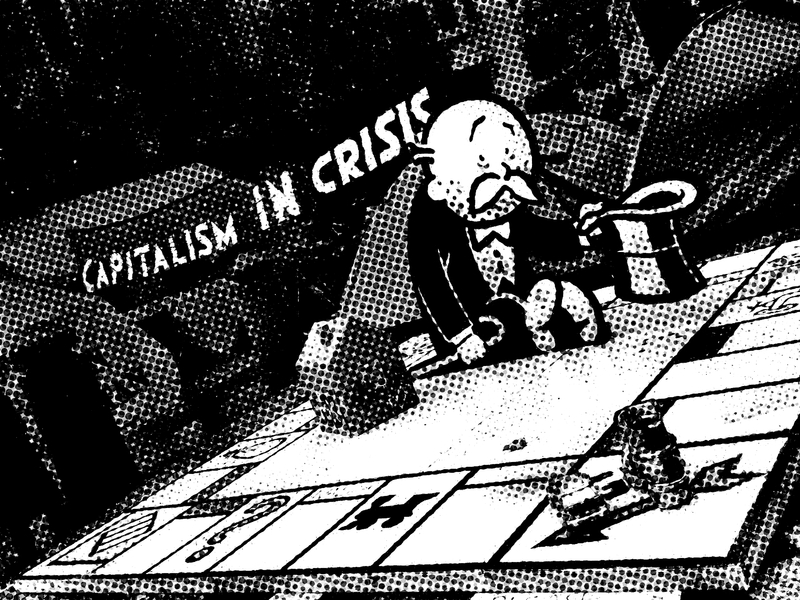 Will this be capitalism’s final crisis as originally predicted by Marx himself, or simply the shift of capitalist power in a world economy to Asia as currently predicted by world systems theory? I can’t say, since I’m being descriptive and not prescriptive. But is capitalism-without-end really possible, or are we quickly reaching the planet’s carrying capacity for cancerous economic growth? That’s a question that will have to wait for a future column. NOTE: Financial capitalism is a whole system, to include the state and most corporations, not merely the international banking system. This must be made clear in a time of Left/Right Red/Brown crossover politics. I’m particularly leery of talk about “international bankers” or that not-so-clever portmanteau “banksters” because it so easily slips into teleological conspiracy theory and “international jewish” idiocy. FOOTNOTE: After La Méditerranée, Braudel’s most famous work is Civilisation Matérielle, Économie et Capitalisme, XVe-XVIIIe (Capitalism and Material Life, 1400-1800). The first volume was published in 1967, and was translated to English in 1973. The last of the three-volume work appeared in 1979. The work is a broad-scale history of the pre-industrial modern world, presented in the minute detail demanded by the methodological school called cliometrics, and focusing on how regular people made economies work. Like all Braudel’s major works, the book mixed traditional economic material with thick description of the social impact of economic events on various facets of everyday life, including food, fashion, and other social customs. The third volume, subtitled “The Perspective of the World”, was strongly influenced by the work of German scholars like Werner Sombart. In this volume, Braudel traced the impact of the centers of Western capitalism on the rest of the world. Braudel wrote the series both as a way of explanation for the modern way and partly as a refutation of the Marxist view of history. Braudel discussed the idea of long-term cycles in the capitalist economy that he saw developing in Europe in the 12th century. Particular cities, and later nation-states, follow each other sequentially as centers of these cycles: Venice and Genoa in the 13th through the 15th centuries (1250–1510); Antwerp in the 16th century (1500–1569); Amsterdam in the 16th through 18th centuries (1570–1733); and London (and England) in the 18th and 19th centuries (1733–1896). He used the word “structures” to denote a variety of social structures, such as organized behaviours, attitudes, and conventions, as well as physical structures and infrastructures. He argued that the structures established in Europe during the Middle Ages contributed to the successes of present-day European-based cultures. He attributed much of this to the long-standing independence of city-states, which, though later subjugated by larger geographic states, were not always completely suppressed—probably for reasons of utility. Braudel argued that capitalists have typically been monopolists and not, as is usually assumed, entrepreneurs operating in competitive markets. He argued that capitalists did not specialize and did not use free markets, thus diverging from both liberal (Adam Smith) and Marxian interpretations. In Braudel’s view, the state in capitalist countries has served as a guarantor of monopolists rather than a protector of competition, as it is usually portrayed. He asserted that capitalists have had power and cunning on their side as they have arrayed themselves against the majority of the population. It should be noted that an agrarian structure is a long-term structure in the Braudelian understanding of the concept. On a larger scale the agrarian structure is more dependent on the regional, social, cultural and historical factors than on the state’s undertaken activities.